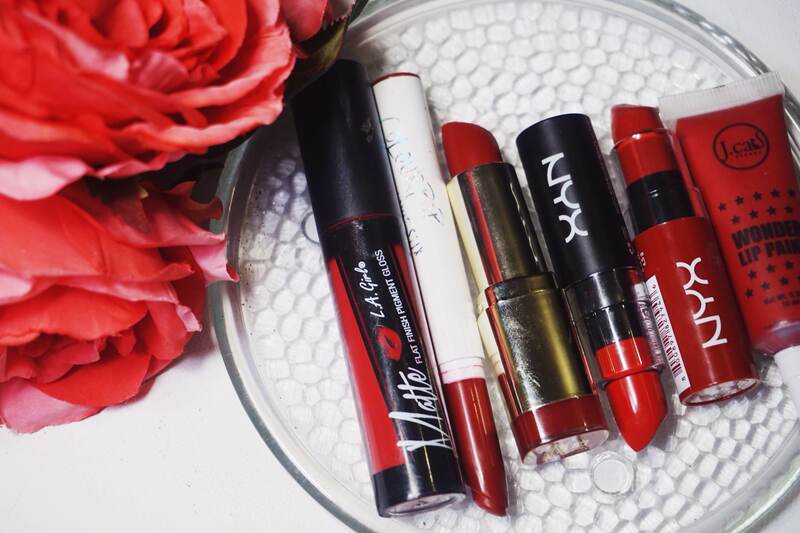 I want to share some of my current favorite affordable red lips. I’ll create a separate post for my favorite high end reds, but it’s not many. I don’t own too many high end reds because there are so many incredible ones that are very budget friendly. For the most part, I wear blue toned shades of red on a daily basis. I’m a coffee drinker, so no, my teeth aren’t exactly blindingly white. Blue toned reds make your teeth look whiter, but a neutral “bright” red won’t make your teeth look yellow. I wear bright reds when I’m feeling a bit more vintage…which is often. Personally, I tend to stay away from yellow and orange based reds. Even when my teeth are looking great, orange toned reds make me look like I brushed my teeth with butter. LA Girl Matte Lipstick in “Frisky” I have mentioned this lipstick several times on my Youtube channel, and I did a review on this line. I love this color. It’s a very true red, and it’s very bright and pigmented. I like the way this formula sets on my lips, and it’s relatively long lasting. Totally worth the $5. Frisky is a very true bright red and I find it to pull fairly neutral on my skin tone. Colourpop Lippie Stick in “Bichette” This has been a favorite of mine for awhile now. Colourpop lippie pencils are $5 each, and it is important to say that there is only 1 gram of product per tube. With that being said, I have rarely finish lipstick. I’m constantly adding things and changing products around, so paying less for less product is fine by me. Bichette is a gorgeous deep cool toned red, and one that I do reach for often, especially on date nights. The finish says matte, but I find the colourpop matte lippie sticks go on a bit creamier, and don’t last as long because of it. Just something to keep in mind. Milani Moisture Matte in “Matte Confident” Okay, this lipstick truly lives up to its name and gives me confidence. This is another gorgeous blue toned red, and can be found at many drugstores for $5! Milani makes some of my all time favorite lipsticks, and this might be one of them. The packaging is adorable and the product is amazing. Nyx Matte Lipstick in “Perfect Red” Another lipstick that lives up to its name. This lipstick is honestly the perfect red. It’s very bright, and very neutral. It’s not going to make your teeth look yellow, and it’s not very dark either. This shade is the perfect shade for recreating 50’s bombshell looks. I love the formula of these as well. Nyx did a great job at making a matte lipstick line that looks truly matte, but isn’t too drying. Nyx Butter Lipstick in “Mary Janes” This is another bright, cool toned red, but it’s a bit glossier. This was a more recent purchase for me, and I adore the butter lipstick formula so much. These truly do glide on very smooth. I do recommend a lip brush for more precise application, and a lip liner to help keep it in place though. JCAT Beauty Lip Paint in “Red Queen” This is the most recent addition to my nice little collection of scarlet babies. The lip paint formula by J.Cat is comparable to the OCC lip tars, but for a third of the price. These don’t come with the nifty little brushes, but they’re nice. This red shade is very bright and pigmented, and I will be doing a full review of these on my Youtube channel soon which will include lip swatches. That’s all that I wanted to share for today! 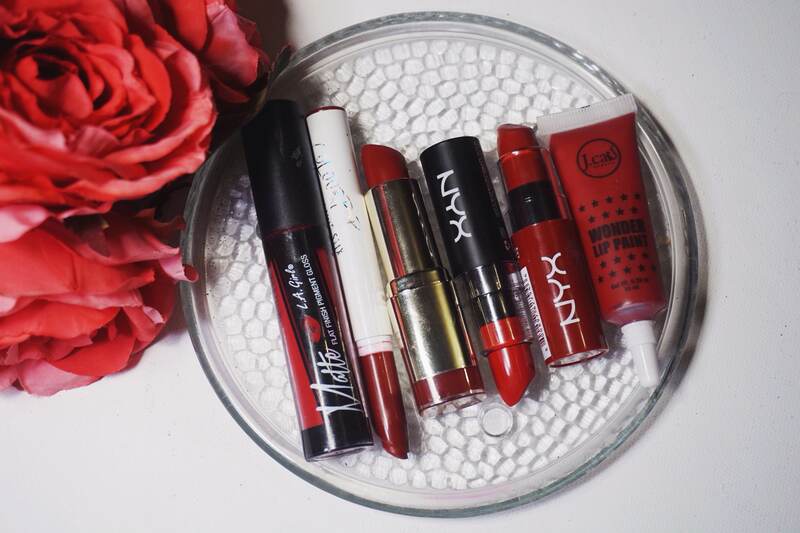 What are some of your favorite shades of red? Tell me in the comments or tweet me! As always, thanks for reading, and if this is your first time stopping by, welcome! I hope you decide to stick around for a bit. I’ve always wanted to try Russian red! It looks so gorgeous…like I need more reds lol. And thank you! NYX Butter Mary Janes is one of my favs too.